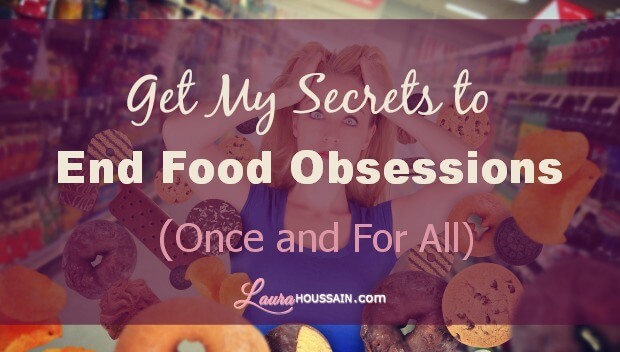 Are You Obsessed With Food? Do you plan your meals all day, get excited about the new food you’re going to try, or just can’t take your mind off of food? This article will show you exactly how to regain control of your mind. Imagine going through the day being fully present at what you’re doing, feeling calm, relaxed, and focused, with food being at the bottom of your priority list. How much more pleasant and peaceful your life would be! Discover how you can do that now below. If you’ve been dieting over and over in a desperate attempt to lose weight, you’ve probably experienced food cravings. When food cravings become constant they lead to food obsession. Your body is so deprived that it’s literally crying for food. What usually happens then is that your food cravings get so intense that you eat something sweet or something you like in order to relieve the pressure. At this point, some people consider that they have blown it, so they might as well finish the whole pack or container of whatever they’re having, and they start binging. If you’ve ever felt guilty about this vicious cycle, you may feel relieved to learn that it’s actually quite a natural process and that food cravings cannot be fully avoided over the course of a diet. Actually, I have read a study linking dieting to food cravings, food obsessions, and binging on food. The diet-binge-diet has been proven to cause the same symptoms in the brain of a food addict as in the brain of a cocaine addict. It’s just almost impossible to resist. Another study shows that highly refined carbohydrates can trigger hypoglycemic reactions that make obese people feel hungry and crave foods in as little as four hours after ingestion. In other words, if you binge on highly refined carbohydrates when you break your diet, you’re more likely to fall into a cascade of binge-eating episodes. You’ll then be tempted to compensate by dieting again, which will lead to more cravings and food obsessions. Unfortunately, studies tend to demonstrate that this binge-eating diet loop modifies your brain pleasure centers in the long run. Food addiction leads to the same craving, reward, and obsession cycle as cocaine or alcohol addiction. Dr. Jean-Jack Wang, director of the Brookhaven Research Institute, et al., proved that obese binge eater’s reaction to the sight of their favorite foods stimulates their brain’s reward center in the same way as any drug addict. A more recent study from the University of Southern California confirms that looking at high-calorie foods stimulates the desire for them and the expectation of satisfaction in the brain. Very early in life you probably noticed that food could provide pleasure. At some point, you may have decided that you needed that pleasure in your life and food was the solution. Food then became a way to distract yourself from what you feel. You may use food obsession to escape thinking about something more unpleasant. I know I often tell the story of my broken marriage and my former husband cheating on me. It was so hard for me to deny the obvious that I used food to numb myself. I also tell the story of when I was so homesick I tried to find the taste of home by comforting myself with eating a familiar brand of cookies. I was not obsessing over food but I was surely waiting for that moment of relief at night. I think a part of me didn’t think I could have done without it. I have been addicted to many things in life. I know that obsessing on what someone thought about me or whether someone loved me were big issues for me. I know the inner works of obsessions. You may have recognized the symptoms of a love addict. I was one. I used to crave getting recognition from others so much that the slightest sign of rejection would haunt me for days. I would also wonder if such and such a guy could love me. I was obsessing on people not on food, but the result was the same. It made it hard for me to focus on my life, and I felt quite disempowered. I also used to search for the perfect “product,” “solution,” or “idea” for hours, days, weeks without taking any action or even buying or using the product. I know I did that when we were burgled. I was in such a state of shock that I looked for the best alarm system for weeks. Obsession gave me a sense of taking action and power when really I wasn’t doing anything. In other words, obsession may be a way to negate your feelings or your needs, or it may be a result of trauma. When you’re focusing on foods all day you’re not focusing on areas of your life. The only way to stop food obsessions then is to allow yourself to acknowledge your feelings and your needs, accept that they are important, and take action to nurture, protect, and provide for you. Maybe you have a belief system that tells you that you can’t take care of yourself, that your emotions and needs don’t matter, and that you’re better off eating. You may not even be aware of that, but if you look at the way you behave, the relationship you have, how you handle conflict, your average levels of personal satisfaction, and the situations that trigger strong emotions or a strong desire to eat, you will soon uncover the story you have been telling yourself about you. Once you know that story, the story you’ve been telling yourself about you, you’ll be able to change it and permanently end food obsessions. The law of attraction says that likes attract each other. That starts with your thoughts. Belief systems are nothing more than habits of thought. According to the law of attraction, a thought attracts a similar thought, and so forth. That’s why it may seem impossible to a food addict to think about anything other than food. To break free from your obsession, you may try to obsess on something else. I have done that myself. I know that a friend of mine noticed that people he knew from AA meetings had become addicted to coffee very much like they were addicted to alcohol. I think we both agree this is not a satisfactory solution. What I would recommend is to focus your mind. Considering that you’ve stopped dieting and found a diet that suits you and is sustainable for life, all you have left is to change your story and your habitual thinking. Another rule of the Law of Attraction is this: “What you resist persists.” Have you ever tried not to think about a pink elephant willingly for three minutes? I know there is a study that demonstrates that when you’re trying really hard not to think about something, you actually can’t help but think about it. This means that trying really hard not to think about food will only make your food obsessions worse. 1/ Find a diet you can follow for the rest of your life. In the second part of this article about goal setting I show you exactly what you need to do to change your life. Any change in your life will lead to moments of fear and doubts. Fear of change used to paralyze me so much that I felt trapped in addiction. Sometimes despair set in and I ended up feeling depressed. Then, I often gave up and fell back into smoking, reading cards, or eating carbs to numb that feeling of powerlessness. You may do the same by setting your focus on food and binge eating. If this is something you can relate to, I’m glad you found me, because I know the way out. It’s really contrary to the strong-will mentality, but it works in days not years. Thank you for sharing. I have all of these same feelings about addiction to food and love, down to it being difficult to deal with any form of rejection. I have felt alone and oftentimes I wish I could turn my thoughts and feelings off for a while because it becomes so mentally exhausting.